I've designed the logo for my next company. I don't know what its gonna do yet, maybe sell ice cream or heavy weapons. Well who knows, but at least I have a name, and for allot of companies thats all you need. A brand and a CEO, I'm already the company of the future. Watch out soon you maybe working for, via an outsourced sweatshop franchise. 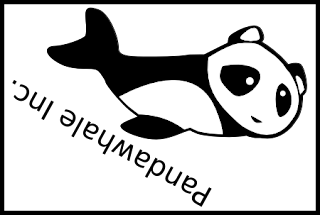 Is it bird, is it a plane, no it's a pandawhale.